Some friends commented that they were amazed at the amount of poems I post on the net and Facebook. I thanked them for their kindness and compliments. When asked, the short answer I always give is it was inspired by a piece of music I heard or from some nostalgia of an event that happened in my life. However the truth is far from that. A poem cannot be created just because I wanted to have one composed. Creativity cannot be forced. 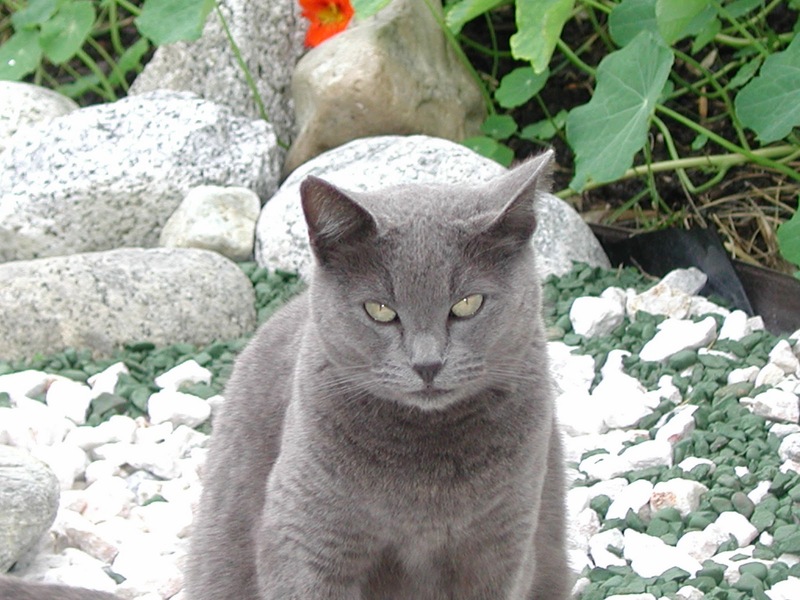 It must come to you willingly like our Blue Kitty. It is also never a day’s work. The final form may span many days, weeks or even months depending on the frame of mind that I was at the moment. Many uncompleted lines were written somewhere in a book, electronic or otherwise. Hopefully one day a revisit to them will cause their Muse to jump out of the pages. By the time the poem’s final form comes to fruition, I have often forgotten what had transpired in my thought process. This time I shall make a conscious effort to document each step of the way so that a more definitive answer can be given. This essay proves that I do not possess the soul of a poet, just a mere glimpse of it. Poems do not pour from my mind like wine from a jug. Each step is fraught with hard work and decision-making. I have to delve deeply into the recesses of my mind to seek out my Muse. 待君解夜寒. Awaiting/entertaining my Lord to dispel his cold night air. 不覺東方紅. Not realizing the east is aglow in red. I was satisfied with the result as it made readers wonder why her Lord did not come. Was there a new favourite? Or were there matters of such paramount importance that he could not meet her? With this, I was able to enter my dream world finally. On Sunday, February 20, 2011 during a mid-morning jog, I recited the poem again and again in my head; making changes here and there; dealing with the mechanics of rhyming. I fiddled with the third line and changed it to 歌曲未得盡, ‘Song and dance not yet ended’. But somehow the line does not seem elegant enough even though I liked the words, 未盡, ‘not yet ended’. My Cantonese is much more proficient than my Mandarin; so all my poems are composed in Cantonese. 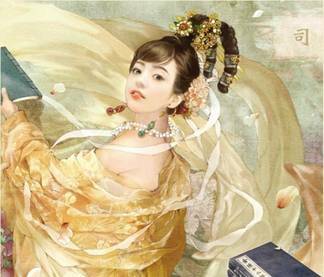 Indeed to Mandarin speakers or speakers from other dialects, the rhyming and tonal scheme may not be correct at all. I profess that I am not a rhyming expert nor am I fluent in the tonal constraints placed on Chinese classical poetry. To me, if it sounds right, then it is alright. 侍君解夜寒. Serving my Lord and dispelling the cold night air. 不覺東又紅. Not realizing the east is aglow again in red. I was smug with myself as I thought the new transformation was good and that this would be the final version. However later in the day, my mind changed again. I felt the way this theme was presented was too straight forward and generated no interest. Drum beating in the days of old signaled danger. Instead of dancing to the beat of drums, they can now be a metaphor for impending war while the couple still in merriment. 侍君解夜寒. Serving my Lord to dispel the cold night air. 東遠(邊)又染紅. Far away in the east once more dyed in red. The changes are now made on the third and fourth lines. Instead of dancing to the beat of drums, it is now a feast still in progress when dawn broke - dyed in red. I chose the word, 染 (to dye) over 漸 (slowly) because the former has another meaning, ‘to infect’, a negative connotation – that the land was dyed in blood. 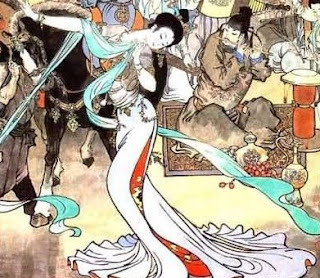 For the astute reader, the poem could be an allusion to the parting night scene of Hsiang Yu and Yu Ji (項羽虞姬) in the opera story (霸王別姬) depicted in the movie, “Farewell My Concubine”. Hsiang Yu was the rival contender to the Founder of the Han Dynasty. Yu Ji was his favourite concubine whose magnificent sword dance performance is famous throughout the land. On that fateful night before his defeat, Hsiang Yu heard songs from his hometown being played from nearby surroundings, a psychological ruse used by the Han side, to trick him in thinking that his homeland was lost. To spur his courage and not let her beauty befuddle his judgment, Yu Ji performed her famous sword dance one last time before committing suicide in front of his eyes. 相逢似夢中. Our chance meeting was like a dream. 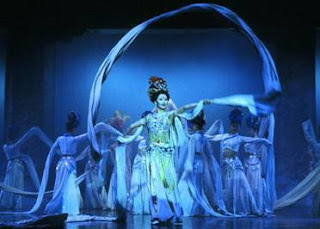 I like the term '驚鴻影' – a startled goose shadow (see http://jeffinous.blogspot.com/2010/04/kingdom-beauty.html). 東遠漸染紅. Far away in the east slowly dyed in red. The tone of the word dance (舞) in this combination did not sound quite right in Cantonese and opted for the word skirt instead. This version too has its merits but upon reflection, the phrases, ‘drum beats’ and ‘dyed in red’ were too explicit. At the same time, the timbre and scenario of the poem were too radical a departure from the original idea. More work and tweaking were needed. Sometimes beating the head against the wall is no way to progress. So I stopped thinking and banged on the piano instead! 東遠漸紅驚鴻裙(影) - Far in the east the red glow approached slowly and startled the swan’s skirts (shadow). To satisfy the seven character format of the poem a descriptive autumn moon (秋月) to the first line was added and enhanced the opening imagery. 今宵秋月酒壺滿 – Tonight, an autumn night, the jug is filled of wine. However I felt the tones were a bit amiss. 月明 (bright moon) is a better choice as it also hinted a touch of autumn because the moon is brightest at that time. Let readers paint their time frames. 今宵月明酒壺滿 – Tonight the moon is bright and the jug of wine is full. The second line proved problematic in construction. It was difficult to find an apt description to fill the spaces between the phrases, ‘Awaiting for my Lord’ and ‘dispelling the cold night air from him’? Took me quite a while to hit upon the action of “to thank her Lord for the privilege of dispelling the cold night air from him”. A very nice idea indeed. However I didn’t like the original words used. 感謝 (to thank) sounds too a modern usage and 感恩 is too ‘Thanksgiving’ for me. 謝恩 (thanking his graciousness) though appropriate but in my eyes made her too submissive and namby pamby. I wanted a stronger lady character. After more soul searching 献恩 was favoured. This term means ‘to give’ or ‘to offer thanks’ to one’s superior. To offer herself in this manner is due to etiquette requirements and not because she is a meek hapless toy of his. For all outward appearances he is her Lord but in her heart she is his equal. At the same time this phrase smacks of hanky panky business about to happen. This makes the poem more interesting and salacious to readers. The word, ‘解' (dispel) also means ‘to loosen’. To loosen his cold night air may mean to warm him up in other ways than just wine. The third line was easily completed by adding “song and dance” before “not yet”. The poem is now complete. I like the ambiguity of the word, 樂 (joy) for it also means music depending on how it is pronounced. Serving my Lord, I offer my love to him, dispelling the cold night air. Far away in the east, the slow red glow startled the swan (goose) skirt. Serving my Lord, I offer my love, dispelling the cold night air. Too soon that eastern glow of red startled my pleated skirt. In the original, there is no indication who is lamenting. It is acceptable to use non-first person pronouns in the translation. 献恩解君寒. I offer my love to dispel the cold air from my Lord. 東紅驚鴻裙. The east is aglow in red startling my pleated skirt. 東曉驚鴻裙. The sudden dawn startled my pleated skirt. 1. It had been more than four years since this poem was posted. I guess my comment proved wrong. Now that my Chinese had somewhat improved, I am updating this poem so that the second and fourth line rhymes. Only one character had been replaced without changing the original intent of the poem. 献恩解君睏. I offer my love to dispel my Lord's tiredness. 2. Later, I didn't think the rhyming scheme was good and so I change it to match the first line as well. 献恩解君悶. I offer my love to dispel my Lord's melancholy. 東曉驚鴻伴. The sudden dawn startled the swan's companion . 献解君愁悶,Offered to dispel my Lord's melancholy.